Adam Sandler has often been criticized – well, more than usual – for using his films as an excuse to go on very nice and luxurious holidays to places like Hawaii, Las Vegas and Africa, at his comfort but our expense. 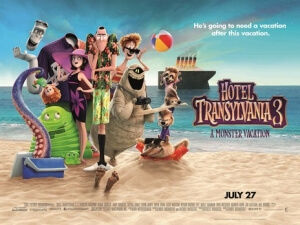 However, Hotel Transylvania 3: A Monster Vacation – the latest instalment in what is currently the only tolerable Sandler franchise out there – shakes things up a little bit; this time, it’s the animated characters going on holiday, while Sandler and his co-stars are presumably stuck in a warm and sweaty recording booth somewhere in Burbank, so it’s not so much their vacation as it is director Genndy Tartakovsky’s, who gets to bring his trademark kinetic animation style to a new adventure that takes the hotel out of Hotel Transylvania, and in the process making something that will undeniably appeal to many, many kids. As far as this series so far goes, though, I personally don’t think it’s quite at the top, but it’s still a wildly amusing ride with some fun characters, giggly humour, and a fantastically unique design and style to it all. In this instalment, Dracula (Sandler) is brought along by his daughter Mavis (Selena Gomez) and all their friends on a cruise ship for monsters, which is run by the human captain Erica (Kathryn Hahn) – it’s her that Drac instantly falls for, but unbeknownst to everyone she is actually the great-granddaughter of legendary monster hunter and Dracula’s arch-nemesis Abraham Van Helsing (Jim Gaffigan), and is hell-bent on helping her great-grandfather destroy the monsters once and for all. That’s about all you need to know about the plot, because much like the previous two movies the focus is way more on the comedy and the characters more than any concrete story, kind of like various vignettes centred on different characters in this particular situation. Aside from Drac’s story, there are several side-plots involving overworked werewolf parents Wayne and Wanda (Steve Buscemi and Molly Shannon) who suddenly find themselves with time to spare once their countless werewolf children are placed in day care; Mavis’ half-vampire son Dennis (Asher Blinkoff) bringing his oversized puppy on board; Frank – as in Frankenstein (Kevin James) – dealing with a gambling addiction (yeah, that happens); and even Drac’s father Vlad (Mel Brooks) is just wowing the local witch ladies. It’s certainly a lot to comprehend, and sometimes it can feel like there’s way too many things going on at once, but the characters are still fun and enjoyable, and the humour still gleefully bouncy, that you’re not too bothered by most of it. In fact, this is one of the rare Adam Sandler films that’s about characters going on holiday, but also allows its audience to join in on the fun rather than just be forced to sit there and watch others have fun instead at your expense. Once again, though, it is Tartakovsky’s animation that is the true star of this film, and indeed the Hotel Transylvania series as a whole. There’s just something to the energy and speed to which these characters move, emote and even speak that really makes the film just bounce around even more, often working well towards the fast-paced slapstick and visual gags that it throws at you constantly, and always setting itself apart from most other animated movies that move at a far more brisk pace. If you’ve ever seen some of Tartakovsky’s television work on 2D-animated shows like Dexter’s Laboratory and Samurai Jack, you’ll easily pick up on the expressive and chaotic animation style that has become his signature; with this series, which is obviously done with CG animation, he’s been given the tools to really go above and beyond the realms of possibilities with this medium and make his style stand out even more, especially in an age where CG has pretty much become the go-to option for most animated movies, and he deserves a great deal of credit for bringing to life what could have easily been just another bland outing under another less-talented animation director. It’s certainly got a lot of energy to it, and fits neatly along with the other movies in this series, though I didn’t find it as funny as the previous films (especially the second one, which is probably my personal favourite of the series so far) nor did I feel it really utilised most of its comedic cast outside of Sandler as much either (you’ll barely remember that the likes of Andy Samberg, Mel Brooks and Keegan-Michael Key are in this film; that’s how little material they are given here). However, it’s a fun film that kids will definitely find plenty of things to laugh at, while the more forgiving adults can open up to the likeable characters and zany madcap humour that this series, and Genndy Tartakovsky’s style in general, has perfected by this point. Hotel Transylvania 3: A Monster Vacation might not necessarily mark the high point of this series, but it fits neatly alongside its two predecessors as a fun and enjoyable excuse for zany comedy, creative visuals, likeable characters, and some stellar animation by director Genndy Tartakovsky who once again excels at bringing his signature kinetic style to this wild and off-kilter adventure.